Mimaki today announced a new addition to its family of digital textile inkjet printers. 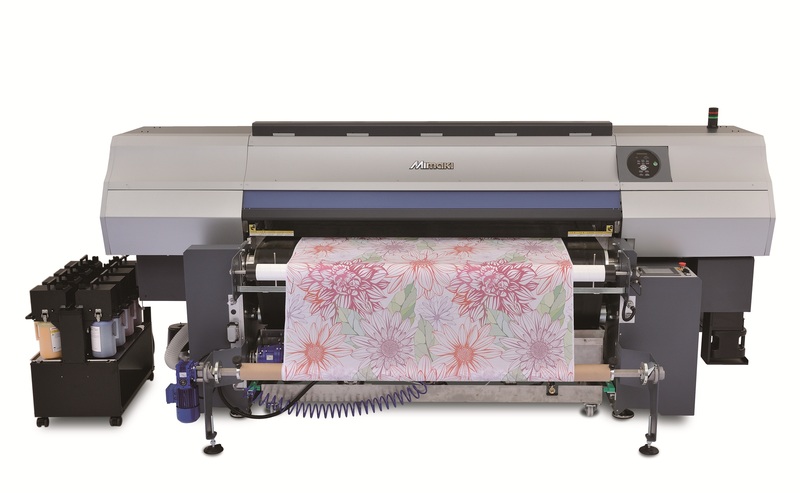 The Tx500-1800B delivers high speed, high quality digital printing on a wide range of textiles, including cotton, silk, hemp and rayon. The new printer joins the TS500-1800 and Tx500-1800DS to round out the company’s broad textile printing portfolio. A specially designed conveyor belt that feeds fabric without tension, enabling high quality printing on elastic materials, even with unattended operation. Print speed 1.6 times greater than conventional Mimaki textile printing products at 60 square meters per hour and 600×450 dpi. Plateless on-demand printing in up to 8 colors with fast delivery of small lot manufacturing for improved time to market. A variable dot function that delivers rich gradation without banding and accurate printing of fine lines for added value in the final product for fashion design. Various ink types that support a wide range of materials to meet the diverse needs of the textile and apparel industries. This includes reactive dye ink (Rc300), sublimation dye ink (Sb300), acid dye ink and pigment ink. Acid dye and pigment inks will be available in the near future. Ink is available in 2-litre ink bottles for reduced ink costs. Automatic process for cleaning and drying the conveyor belt between or during projects to ensure that media is protected from staining or dampness.